From its origin as a simple printer interface, the personal computer's parallel port has evolved into a place to plug in just about anything you might want to hook to a computer. The parallel port is popular because it's versatile-you can use it for output, input, or bidirectional links-and because it's available-every PC has one. Desde su origen como una interfaz simple impresora, el puerto paralelo del PC se ha convertido en un lugar para conectar casi cualquier cosa es posible que desee conectar a un ordenador. El puerto paralelo es muy popular porque es más versátil que se puede utilizar para la salida, entrada, o bidireccional links-y porque está disponible, cada PC tiene uno. Las impresoras son todavía los dispositivos más comunes conectados al puerto, pero otras opciones populares incluyen cinta externa y las unidades de disco y escáneres. Los ordenadores portátiles pueden utilizar una interfaz de red basado en puerto paralelo o joystick. Para aplicaciones especiales, hay docenas de dispositivos de puerto paralelo para su uso en la recopilación de datos, pruebas y sistemas de control. Y el puerto paralelo es la interfaz de la opción para muchos proyectos uno-de-su tipo y en pequeña escala que requieren comunicaciones entre un ordenador y un dispositivo externo. Essentials. Defining the Port. Port Types. System Resources. Addressing. Interrupts. DMA Channels. Finding Existing Ports. Configuring. Port Options. Drivers. Adding a Port. Port Hardware. Connectors. The Circuits Inside. Cables. Multiple Uses for One Port. Security Keys. Alternatives to the Parallel Port. Serial Interfaces. Other Parallel Interfaces. Custom I/O Cards. PC Cards. Accessing Ports. The Signals. Centronics Roots. Naming Conventions. The Data Register. The Status Register. The Control Register. Bidirectional Ports. Addressing. Finding Ports. Direct Port I/O. Programming in Basic. Other Programming Languages. Other Ways to Access Ports. LPT Access in Visual Basic. Windows API Calls. DOS and BIOS Interrupts. Programming Issues. Options for Device Drivers. Simple Application Routines. DOS Drivers. Windows Drivers. Custom Controls. Speed. Hardware Limits. Software Limits. Programming Tools. Routines for Port Access. Data Port Access. Status Port Access. Control Port Access. Bit Operations. A Form Template. Saving Initialization Data. Finding, Selecting, and Testing Ports. Experiments. Viewing and Controlling the Bits. Circuits for Testing. Output Types. Component Substitutions. Cables & Connectors for Experimenting. Making an Older Port Bidirectional. Cautions. The Circuits. The Changes. Interfacing. Port Variations. Drivers and Receivers. Level 1 Devices. Level 2 devices. Interfacing Guidelines. General Design. Port Design. Cable Choices. Connectors. Cable Types. Ground Returns. -wire Cables. Reducing Interference. Line Terminations. Transmitting over Long Distances. Port-powered Circuits. When to Use Port Power. Abilities and Limits. Examples. Output Applications. Output Expansion. Switching Power to a Load. Choosing a Switch. Logic Outputs. Bipolar Transistors. MOSFETs. High-side Switches. Solid-state Relays. Electromagnetic Relays. Controlling the Bits. X-10 Switches. Signal Switches. Simple CMOS Switch. Controlling a Switch Matrix. Displays. Input Applications. Reading a Byte. Latching the Status Inputs. Latched Input Using Status and Control Bits. Bytes of Input. Using the Data Port for Input. Reading Analog Signals. Sensor Basics. Simple On/Off Measurements. Level Detecting. Reading an Analog-to-digital Converter. Sensor Interfaces. Signal Conditioning. Minimizing Noise. Using a Sample and Hold. Synchronous Serial Links. About Serial Interfaces. A Digital Thermometer. Using the DS. The Interface. An Application. Other Serial Chips. Real-time Control. Periodic Triggers. Simple Timer Control. Time-of-day Triggers. Loop Timers. Triggering on External Signals. Polling. Hardware Interrupts. Multiple Interrupt Sources. Port Variations. Modes for Data Transfer. The IEEE 1284 Standard. Definitions. Communication modes. Detecting Port Types. Using the New Modes. Port Detecting in Software. Disabling the Advanced Modes. Negotiating a Mode. Protocol. Controller Chips. Host Chips. Peripheral Chips. Peripheral Daisy Chains. Programming Options. Compatibility and Nibble Modes. Compatibility Mode. Handshaking. Variations. Nibble Mode. Handshaking. Making a Byte from Two Nibbles. A Compatibility & Nibble-mode Application. About the 82C55 PPI. Compatibility and Nibble-mode Interface. Byte Mode. Handshaking. Applications. Compatibility & Byte Mode. Compatibility, Nibble & Byte Mode with Negotiating. Enhanced Parallel Port: EPP. Inside the EPP. Two Strobes. The Registers. Handshaking. Four Types of Transfers. Switching Directions. Timing Considerations. EPP Variations. Use of nWait. Clearing Timeouts. Direction Control. An EPP Application. The Circuit. Programming. 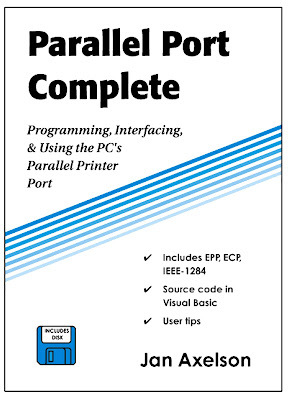 Extended Capabilities Port: ECP. ECP Basics. The FIFO. Registers. Extended Control Register (ECR). Internal Modes. ECP Transfers. Forward transfers. Reverse Transfers. Timing Considerations. Interrupt Use. Using the FIFO. Other ECP Modes. Fast Centronics. Test Mode. Configuration Mode. An ECP Application. PC-to-PC Communications. A PC-to-PC Cable. Dos and Windows Tools. MS-DOS's Interlnk. Direct Cable Connection. A PC-to-PC Application. Appendices. Resources. Microcontroller Circuit. Number Systems.